Trump’s stop in South Korea suggests he has no idea what his strategy is. Trump’s trip shows what happens when a world leader is set adrift in the world with no strategy or goals. 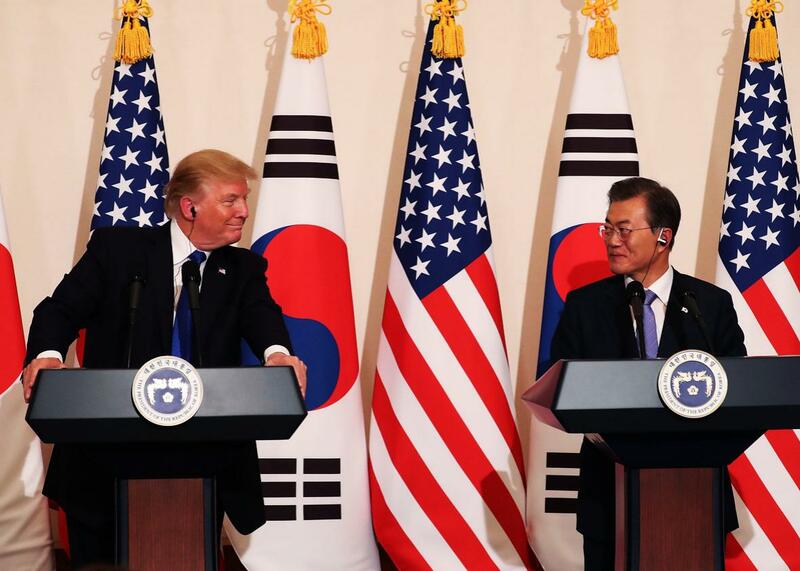 President Donald Trump with South Korean President Moon Jae-in during their joint press conference on Tuesday in Seoul, South Korea. Almost halfway through his 12-day voyage in Asia, President Trump is showing what happens when a world leader takes major diplomatic initiatives without a full diplomatic team or a thought-through notion of goals, means, and strategy. His three days in China, followed by a meeting with Russian President Vladimir Putin on the sidelines of a summit in Vietnam, are seen as the trip’s likely high points, but the prospects for progress, in either diplomacy or trade, are viewed as dim. His first stop, in Japan, yielded none of the trade benefits that he’d said he would seek. His stop in South Korea, which included a joint press conference with South Korean President Moon Jae-in on Tuesday and a speech in the South Korean parliament on Wednesday morning, was met with relief, in that he affirmed America’s commitment to Seoul’s security and dialed back the “fire and fury” rhetoric that he’d recently aimed at North Korea. But his views on war and peace in the region remain no less muddy than before. But this message was more muddled than he may have believed. Keep testing your missiles and your nukes, he was telling Kim Jong-un, and your regime will be finished—but give them all up, and … and what? That’s the unanswered question: What would he offer the North Koreans in exchange for surrendering the only strategic assets they have? Trump advised them that the missiles and the nukes “are not making you safer,” but Kim has reason to believe otherwise. Saddam Hussein and Muammar Qaddafi dismantled their nuclear programs, one way or the other—and they’re dead. Kim no doubt thinks that hanging on to his weapons offers a way—maybe the only way—to keep him and his regime alive. And why should he strike a deal with Trump? The Iranians dismantled their nuclear program in a deal negotiated with six foreign powers, and the International Atomic Energy Agency says they’re abiding by its terms—yet Trump wants to abdicate the deal simply because he doesn’t like it. In the joint press conference, Trump said, “I really believe that it makes sense for North Korea to come to the table and to make a deal that’s good for the people of North Korea and the people of the world.” But what kind of deal does he have in mind that would be good for Kim’s regime? Trump didn’t say or even hint that he has one in mind. If he demands that such a deal “begins” with Kim giving up his assets, it’s a nonstarter. When asked about whether there’s been progress toward a deal, Trump replied, “Yes, I think we’re making a lot of progress. … I do see certain movement,” but then outlined only the recent U.S. military deployments—three aircraft carriers and a nuclear submarine within firing range—that he thinks will make Kim tremble and succumb. He declined to say whether direct talks are going on, but the evidence suggests they are not. There were such talks, headed by Joseph Yun, a professional diplomat who was the emissary to North Korea under President Obama and who has retained that title at least formally. But the talks ended after Trump derided them as a waste of time in a tweet, and since then, Yun has been sounding the alarms—in public and private—about the absence of diplomacy and the ratcheting toward war. If it doesn’t work out and if Trump follows through on his threat to go to war, there’s little reason to believe that will work out either—which may be leading Kim to take those threats less than seriously. In a recent briefing, Pentagon officials concluded that North Korea’s nuclear materials are buried deep underground—making them invulnerable to an attack. The same officials have no doubt drawn up war plans that bomb other North Korean military targets and destabilize Kim’s regime. But do they have a plan to replace the regime with one less hostile to (or fearful of) the West, or less dedicated to building a nuclear arsenal? Doubtful. One purpose of that arsenal, no doubt, is to deter an enemy attack—a reasonable idea, given that Trump has threatened, over and over, to launch one. Trump is pinning so much on the latter part of his Asia trip—the meetings with Presidents Xi Jinping and Putin—because he’s hoping that they can use their leverage to pressure Kim to come to the table, or maybe to oust him from power: It’s unclear what he thinks they can accomplish, or what he is willing to give them in exchange for a try. For the moment, Trump seems to be having a merry time in the Far East. He’s being feted and humored, as most world leaders have learned to do to make this strange American president happy and pliable. But in his quest for the theatrics of respect, he is ignoring the requirements of security; it’s not even clear he knows what those requirements are, or what he needs to do to fulfill them.